So many bookish tidbits to share with you this week! #2 Like a lot of communities, Omaha has chosen one book for the city to read together (Omaha Reads). This year's selection is Jonis Agee's The Bones of Paradise (which my bookclub will be reading for October). As part of the celebration of that book, the Omaha Public Library system has lined up speakers/authors whose books or areas of expertise tie into The Bones of Paradise in some way. 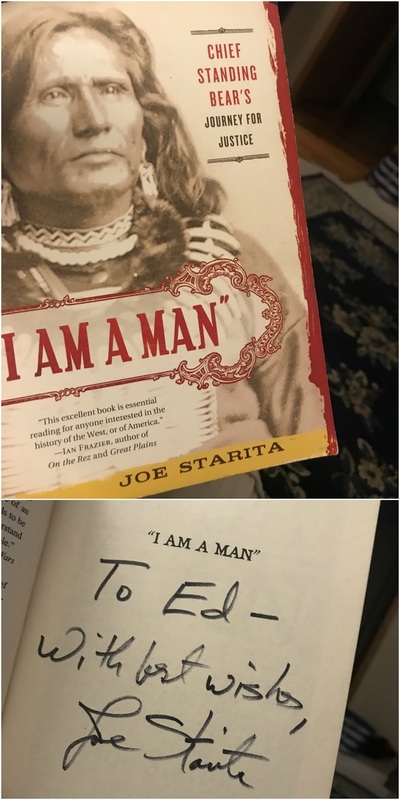 Wednesday night, a friend and I went to hear journalist/teacher/author Joe Starita talk about his book, I Am A Man: Chief Standing Bear's Journey For Justice. Starita was a great choice; he is passionate about the subjects he writes about and about story telling in general. He spoke for 45 minutes then took another 30 minutes just to answer two questions! The money he made selling books last night all goes into a scholarship fund for Native American high school seniors for college. It was great to see people who already had the book drop off money just for the scholarship fund or add a couple of extra dollars to their purchase. As it happens, I had my parents' copy and was able to get it autographed for them. #3 I mentioned yesterday that we had gone to the Milwaukee Art Museum while we were in that fine city. Mini-me wanted to get us into the building (it's an incredible structure) but he was also eager to have us see the works of Rashid Johnson. The biggest piece on display is titled "Antoine's Organ." It's an incredible work. And why might it be relevant to this blog? Because throughout the work, Johnson has included books about the black experience in America, including Richard Wright's Native Son, Te-Nehisi Coates's Between The World And Me, and W. E. B. Dubois's The Souls of Black Folks, all of which I'd like to get read one of these days. In the final room of the exhibit, copies of the books were available for people to sit down and read through; of course, they were all available for purchase in the gift shop as well. I loved seeing the book world and the art world blended together. #4 Finally, it's September, which means it's time for my annual Fall Feasting reading. Because I kind of forgot about it and because I want to make time for R.I.P. 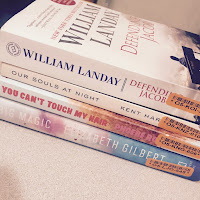 reading and Nonfiction November reading, I'm probably only going to get a couple of foodie books this fall. 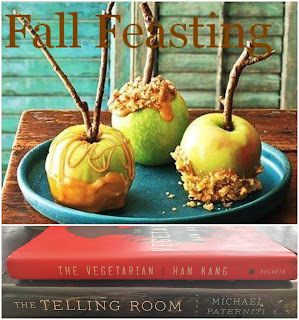 I do have other books that could work for both Fall Feasting and Nonfiction November so I may be able to get one of two more worked in as well; but, for now, I'm shooting on (finally) reading The Vegetarian by Han Kang and (in honor of the people I love who live in Wisconsin) The Telling Room: A Tale of Love, Betrayal, Revenge, and the World's Greatest Piece of Cheese. I'd also like to take the time to read a cookbook as well; you know, the kind that don't just have recipes but all kinds of great information about food and cooking. Perhaps the one that's simply titled Soups? It is, after all, the perfect time of year to find some new soup recipes! Do you ever just sit down and read your cookbooks? I like the sound of You Cant Touch my Hair. Quirky? Cookbooks have occasionally made it into my stack, especially for evening reading when the other books are too disturbing. Cookbooks are rarely disturbing. 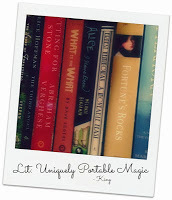 (*giggles*) Anyway, I wanted to comment on the Elizabeth Gilbert, which I was expecting to find very light and tidy but her way of stating the obvious really worked for me and I quite enjoyed Big Magic after all. Hope you do too! I hope you like Defending Jacob. I listened to the audio and really enjoyed it. That's cool that your city has chosen a book to read. Mine hasn't ever done that, and I really don't see it happening. I am afraid I haven't ever sat down to read a cookbook--not since I was a child. 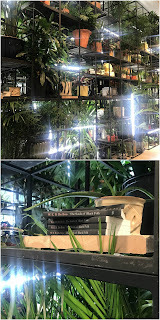 I am not a fan of cooking (my husband is the cook in our family), and so tend not to gravitate towards cookbooks at all. I really enjoyed Defending Jacob (I listened to the audio) and loved Our Souls at Night. It's a gentle, quiet sort of novel. Starita had a signing at my old B&N last year and had a large crowd listening to him speak, as well as getting their books signed. He's always a hit with the locals. Watching Oregon crush the Huskers. Maybe things will improve after halftime?